BangkokPhang Nga Province is located 788 km south of Bangkok and just a short drive from Phuket, Khao Lak and Krabi. Within Phang Nga Province is Ao Phang Nga Bay Marine National Park which covers an area of about 400 sq km. Phang Nga Bay is famed for it’s beautiful evergreen forests, mangroves and beaches as well as the limestone rock formations and is protected by national park status. The unique topography, formed over millions of years has created islands that rise vertically from the bay like needles. The islands are narrower at sea level due to water erosion and many have cave entrances that give access to inner lagoons of outstanding beauty. 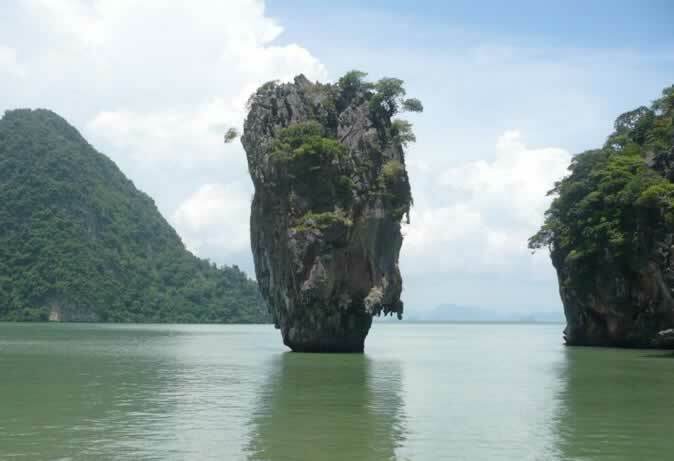 These inner areas are called Hongs (rooms) in Thai and can be explored when tides allow. 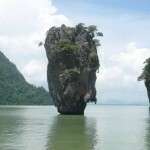 Keen naturalists will love Phang Nga bay. There are various species of frog including marsh frog and crab eating frog and over 120 bird species including ospreys, egrets, white bellied sea eagles and swiftlets whose nests are harvested to make birds nest soup. Reptiles include flying monitors, pit vipers and dog face water snake to name just a few. Have some wave smashing fun in Phang Nga Province. Rafting Tours you can combine with ATV rides, Elephant trekking, Flying fox rides and more..
Koh Tapu – More famously called James Bond island after The Man with the Golden Gun was filmed there. It is a lone pillar island, a picture postcard favourite. Khao Ping Kan – Next to Koh Tabu, with it’s split in two rock formation. Khao Khian – has cave paintings over 3000 years old believed to have been painted by fishermen sheltering from monsoons. Tham Lot – A huge limestone hollow that boats can pass through into a mangrove forest. It’s common to see water monitor lizards on the rocks or swimming here. Banded sea snakes can also be seen in the water. Koh Panak – A beautiful island with caves containing stalactites and stalagmites. Hong Island – Another wonder of creation that boats can serenely sail into. Koh Panyee – A sea gypsy village built on wooden stilts. Wat Sawan Kuha (aka Wat Tham) – This temple a cave temple with a big Buddha statue inside the cave. It’s popular (especially with kids) because of all the monkeys outside. Easy Day Thailand can book and organize your Phang Nga tours, activities and more. Just use our 1-2-go contact form.